A few months ago I entered a Joann Fabrics and left with the Designer Ruby Royale Sewing and Embroidery Machine. 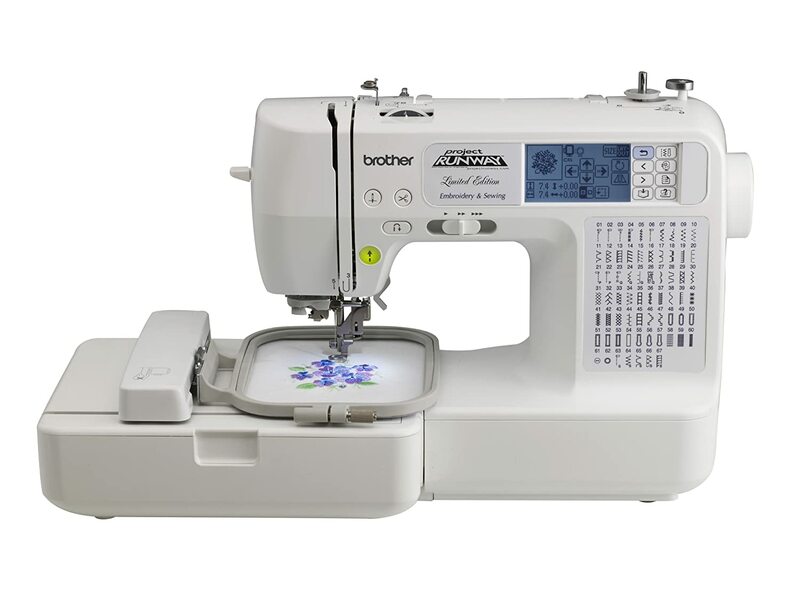 This combination sewing/embroidery machine is great for anyone who plans to sew and/or embroider and sell goods and wants a lot of automated features. With the machines large touch screen, deluxe Stitch System (adjusts to the best embroidery settings for your project as you go) and large embroidery/sewing area I feel like I got a major upgrade. For some background, before this, I had the Brother LP6800 Sewing and Embroidery Machine, Project Runway Addition. For an introductory and sewing machine, I can’t complain too much about my old machine. It had a lot more power than the standard Brother sewing machine I had before. It was awesome for the tote bags I made with Duck Cloth. Plus the needle threader is out of this world. However, I felt I needed a upgrade for many reasons; the main ones being more reliability when embroidering (the embroidery wasn’t always flawless, I ran into issues more than I would have liked) and larger embroidery and sewing space. So, although, I had no major complaints about the machine, it is a machine that is more suited for those who just want to do simple small embroidery designs; introductory and intermediate sewing/embroidery. Whereas, I wanted to begin to sell my creations and launch my website SewStrawberrySweet.com. I think the biggest draws for me and anyone who is making a similar machine upgrade are the automated features, large embroidery and sewing area and on-screen features. I’ll skip over the “basic” features in this written review like lots of fonts to choose from, hundreds of stitch selections etc., but know that this machine does include all those features. Follow THIS LINK to see all the features and benefits Huqvarna calls out on their website. When it comes to sewing, the machine includes what Viking calls the “Exclusive Sensor System™,” which senses fabric thickness for even feeding and great presser foot. There is also an on-screen Sewing and Embroidery Advisor that provides guidance that optimizes sewing and embroidery. You can also click the question mark icon on the top right of the screen and then click any other on-screen icon and a box pops up to explain what that button/feature is. That feature has come in handy a few times for me. The machine comes with two embroidery hoops a 360 x 200mm and a 120 x 120. For those of us that don’t speak metric (ahem, Americans) that larger hoop gives you about 14″ x 8″ of space to embroider. That was simply unimaginable for me, my Brother only had a 4″ x 4″ embroidery space. Of course, the ability to embroider a large area also translates into lots of room for sewing. I imagine the machine would have no trouble holding a roll of even the bulkiest quilt. You can see an example from Husqvarna’s site below. high resolution (640×480).” On screen, you can change thread colors, adjust design position and size and much more. I could not tell you how much being able to change the thread colors on-screen has helped me. It makes telling which portion you are embroidering next so much easier. There is also a little “+” sign on screen that shows what part of the design you are currently embroidering. This is awesome, as sometimes embroidery designs seem to have no rhyme or reason in the approach they take to stitching out a design until you’re able to see more of the full picture. With the little “+” sign leading the way, it is super easy to keep track of where you are in the current design. I love the Ruby’s ability to layer designs. For instance, you are embroidering a throw pillow with the first letter of your name, but want to add a little pzazz. You can add that letter onto the screen and resize, re-color and move it to your liking; then go back to the menu and add another design to the screen like flowers or a heart. You name it! Smart Save; this feature can seem a little tricky at first, but all you have to do is go into the menu and check the box to turn it on. Once enabled, you can stop wherever you are in an embroidery project and turn off the machine. When you next turn on the machine you go into the heart menu and you can upload the design and it’s ready to go right where you left it. Just be careful that you don’t open another embroidery design before you load your last or your project will be lost! Speaking of saving, saving is a wonderful thing on the Ruby Royale. I wasn’t able to find online exactly how many designs you can save on the machine, but I have uploaded quite a few designs since I got the machine and have received no warnings that I was running out of space. The machine comes with a 1GB flash drive you can use to upload designs for easy transfer from computer to machine and to save space. An added bonus of the large color screen is that once the designs are given a moment to load you can easily see what design is what. You can edit designs names right on screen. You can even create additional folders to help organize your designs! Pretty darn cool. This machine does beautiful work. You’ll find that each job you finish looks professional and is something you want to share with the world. I have done the smallest of embroidery and the biggest and the Ruby Royale has yet to let me down. It looks awesome while doing it too. This machine really has a way with thread. The Ruby has tons of built in features and stitches that help you to make beautiful applique designs. It’s ability to sense the fabric and it’s large embroidery area have helped me to do some really cool things. I have yet to find a thickness this machine did not like. When you follow the on-screen instructions about the best needle and foot to use for the job, you should not have any issues making something gorgeous. I may be young, but my eyes are already not what they used to be. This machine is very well lit with wide reaching LED lights. You’ll find there’s plenty of light for the more detailed tasks. The foot pedal is wide and grips well on most surfaces. It also has an awesome retractable cord. I cannot tell you how many times I have brought my machine to a friend’s house and realized I had the pedal, but not the cord or vice versa. Problem solved! When I tell you the invisible zipper foot changed my life I am not lying… Only exaggerating a bit. It hasn’t quite changed my whole life, but it completely changed the way and the speed I am able to insert invisible zippers. I bought the invisible zipper foot at my local Joann’s and it works so well I almost only want to exclusively use invisible zippers, even in tote bags! Trust me on this one, if you have this machine you are going to want to get the invisible zipper foot. It’s magic. Here’s a look at everything that comes in the box(es). The slide in arm storage on this machine is great; there’s a place for all the feet and a few bobbins. The best part is it’s completely accessible while sewing. I say almost, because it’s hard for a manufactured item to compete with nature, but Viking gave it it’s best shot. The machine is very pretty to look at and fits in beautifully in my sewing space. There are no awkward parts that stick out and the cords and ports are well thought out and placed. I created a custom recessed desk for my machine to sit in and it seems the manufacturers thought out the placement for the ports so they don’t bump into the edges of the desk or get in your way when you’re using the machine. Drum roll please… It all comes down to this; the Husqvarna Viking Designer Ruby Royale Sewing and Embroidery machine is a major time saver. You might say, “That’s not a feature!” However, you would be like, so wrong. Think about it, time is money and this machine cost a whole lot of money, but the many features that have saved me time have contributed the most in making me feel all that money was worth it. The Ruby Royale’s on screen Sewing and Embroidery Advisors, sensing tech when embroidering and the ability to thread a bobbin with the second motor while embroidering at the same time, have saved me some major time. Tasks that used to be frustrating on my old machine, now have a new luster to them. Time is money and this machine has given me a whole lot of that sweet currency back. The Designer Ruby Royale is clearly a machine that was made by someone who sews or who clearly had them in mind. Many companies can make a sewing machine. Shoot, I’m sure General Motors could if they wanted to, but few companies know how to make a sewing machine that is made to work in the way a sewist will use it. Many features on this machine I did not know I needed them until I was presented with them. It is truly the simple stuff that makes this machine a gem… A ruby. When I use my Ruby Royale I feel like the machine was made for me, a sewist. Okay, you have probably been thinking to yourself this whole review, “Is there anything she didn’t like. This machine sounds perfect and that simply cannot be.” You’re right; the Ruby Royale is not perfect. The needle threader is not so automatic. For instance, my very top pet peeve is the needle threader. It irks me even as I write this review. The needle threader works fine. Just fine. It’s automatic, but only so much. When it comes to threading the needle my $300 Brother machine blows it out of the water. I could pull one lever on that machine and bam, needle threaded. My Ruby requires much more of me, not too much, but enough that I get frustrated that for all the money I paid that it isn’t a one step process. It’s the standard pull down the lever, tuck the thread behind, let the lever go and pull the loop from the needle threading process. It’s interesting Viking could not follow in Brother’s steps here, but maybe there is some product patent I am not aware of. Who knows? Sure, the machine itself will get you off to a good start when it comes to the basic manipulating of embroidery designs. However, if you really want to do some damage and create your own designs you are going to have to reach back into that pocketbook and invest in some digitizing software. I would recommend considering investing somewhere else than into the Premier+ Software that is made into the machine. It’s super pricey and I’m not so sure it is superior enough over other options, like Embird, to be truly worth the $800+ price tag. I’d love to test it for myself, but alas my wallet is empty. This machine is expensive. There is no other way to put it, my wallet is still crying. You will find the machine at your local dealer or on eBay ranging somewhere near $5,000. That’s a lot of dough. That kind of money could buy you a used car. The Ruby Royale can help you make money of course, but it’s still going to cost you on the front end. I should also note here, that most dealers offer a financing option which makes this pricey machine much more attainable. I got special 0% interest financing for 36 months through Affirm. And through some witchcraft the financing doesn’t even show on my credit report. Yeah, I don’t know either, but it’s fine with me. There are also a handful of warranties that cover the machine; just make sure you take the time to register the machine. Along with this you can also download a free version of the Premier+ Software that allows you to view your embroidery designs as icons in the folder they are saved in (love this feature!) You can also view designs in the program and print them out at scale for use as templates or dielines. I cannot recommend this machine for everyone who sews or embroiders. If you are just a hobbyist who sews once a week or less I’m not so sure you can justify the price tag on the Ruby. I would say this machine is well suited for someone who plans to sell goods and use this machine at least three times a week, if not everyday. This machine will make the simple stuff easier and the harder stuff seem easy. You can save lots of designs and edit them on screen. You have plenty of space for embroidering, sewing, and quilting. The machine is well built and has plenty of power for the more heavy-duty jobs. The on screen advisers and sensors will help you along the way. Plus, you are going to get some high-quality results in all that you do. As a side note, I would also add that most dealers offer some free classes when you buy the machine to help you get started. I found the learning curve on it to be a little steeper than expected. However, once you clear the curve you’ll find the machine is more than intuitive and a joy to use. Are you now itching to buy the Husqvarna Viking Designer Ruby Royale? Or has my review convinced you to put it on the back-burner or look for a sewing/embroidery machine elsewhere? Please let me know your thoughts in the comments. It’s always sweet to hear from my readers. Until next time, stay sweet, Sweeties! Ps. I wanted to hurry and get this review published, but stay tuned for a YouTube review!